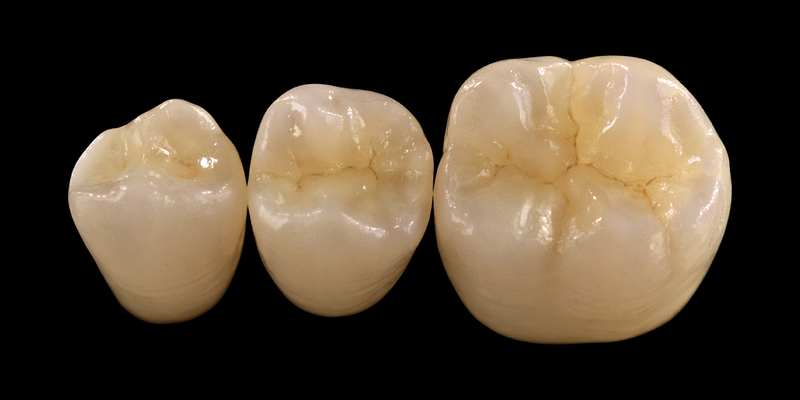 A reoccurring issue in the dental industry is the question whether solid, full-contour Zirconia crowns are the best choice in the view of aesthetics, abrasion characteristics, compatibility and strength. As far as (full-anatomical-contour) solid Zirconia restorations are concerned, a special translucent Zirconia material is needed first. For this reason we use translucent Prettau Zirconia which is used in conjunction with a specialised colouring technique that eliminates the use of veneer ceramics entirely. In this way, full-Zirconia restorations, i.e. the ‘Prettau Bridge’ can be realised. Prettau Zirconia comes into a world of its own especially in the field of implant dentistry, in cases of limited available space or restorations with tissue flanges. One of the many advantages is the complete elimination of posterior occlusal chipping because only the labial or buccal surfaces are porcelain veneered; all functional areas are maintained as solid Prettau Zirconia. Prettau Zirconia is used in all kinds of restorations. Zirconia is the result of a chemical process: the basis is Zirconia sand, partially stabilized with Yttrium, and made into Zirconia blanks through a mechanical process. Zirconia dioxide is, without any doubt the material with the highest stability and fracture toughness. Zirkonzahn offers the only true high tanslucent zirconia, in its extra translucent Prettau Zirconia product. In combination with Prettau Colour Liquids and the stains we are able to create full Zirconia crowns or bridges, eliminating ceramic chipping. Higher translucency thanks to the Zirconia‘s optimised microstructure means no ceramic chipping, no abrasion so the antagonist tooth has 200% higher flexural strength thanks to the eliminiation of the veneer ceramics. Teeth are modelled and milled as usual, but then coloured with the special colour liquids and sintered in the sintering furnace with a specially elaborated program for that purpose. The occlusal surface no longer needs to be tediously covered with ceramics, but can simply be copied from the completely modelled tooth. Prettau® Anterior – The new Zirkonzahn zirconia material is as translucent as lithium disilicate but has a higher bending strength. It is particularly suited to the anterior tooth region, for single crowns, inlays, onlays, max 3-unit bridges (full anatomical or reduced). It is fully biocompatible with a fast production time. 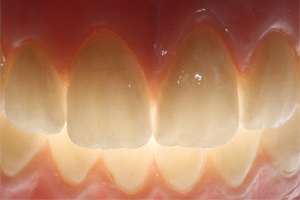 By contrast veneer porcelain (or even metal) will cause wear on natural dentition due to its highly porous structure which acts like sandpaper. Rub wood against a smooth glass pane and nothing will happen but, rub wood against wood and it will splinter. As two materials of the same kind meet (tooth against tooth), natural dentition will inevitably wear also. However, when natural tooth meets smooth Zirconia (like wood against glass) no abrasion occurs. The abrasive nature of any material is determined by its degree of surface polish and inherent density. The ”softer” enamel will glide over polished, much harder Zirconia without wear.